Fundraise for the N.M. Faith Coalition for Immigrant Justice with music from Rahim AlHaj Trio and others, a talk, refreshments, poetry by María José Ramos and arts and crafts. Please come, invite your friends, and spread the word. Amidst all the struggle immigrants, asylum seekers and refugees have been facing, we invite you to join us to stand strong together, to be with community, and to have a moment to unwind and recharge. We are very pleased that the Rahim AlHaj Trio will be our featured musicians—Led by Rahim AlHaj, world renowned Iraqi oud musician and composer (from Albuquerque! ), and joined by Sourena Sefati playing santour and percussionist Nicholas Baker. Just prior to this performance, our incredible staff will provide a brief immigration update. Also, we’ll give our annual Social Justice award to both a group of families who have been organizing and working to support each other in these difficult times as well as Sister Marlene Perrotte, who has done incredible work with asylum seekers and other migrants in and out of detention. After the program we’ll move into UU's social hall for snacks and more music— beautifully provided by Café Bomba: Dan Golden—guitarist; Bonnie Schmader—flute; Alexi Castillo—percussion. 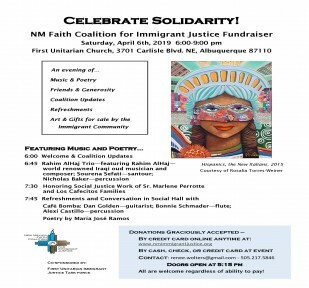 Albuquerque’s outstanding poet María José Ramos will also perform. Doors open at 5:15—Time for you to check out the art and gifts for sale created by members of the immigrant community. Purchases will help support these individuals and their families. Donations are encouraged. Skip the line and donate in advance online at nmimmigrantjustice.org. Cash or checks preferred at the event. All are welcome, however, regardless of ability to pay. Mark your calendars today! Share the attached flyer with friends, family, and your faith community, please!